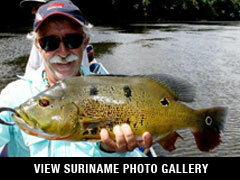 Suriname offers a brand new world of jungle sport fishing, with some of the largest Red Tail Catfish in all South America, as well as Giant Wolfish up to 35 pounds and Peacock Bass. Kabalebo Nature Resort and Uncle Piets Fishing lodge is located in one of the most remote areas of the Amazon Jungle. The only human presence in this untouched natural area is the resort created by owner Karel Dawson. The Kabalebo River flows like a mountain stream, lined by rainforest with rocky outcroppings carefully navigated by the lodge's staff. For fishing, wildlife and Amazon adventure, put Kabalebo on your list of top places to explore. The Kabalebo River is an angler's paradise, teaming with fish. Among the sport species are red tail catfish weighing as much as 60 kg, giant wolfish up to 35 pounds, pacu, surubin catfish, and of course the piranha and peacock bass. International airfare, airport arrival and departure tax, other taxes, meals at hotel, fishing tackle, gifts or other items of a personal nature. Prime time fishing season is August - April. Your fishing trip will begin when you arrive in Paramaribo. You will be greeted at the airport and taken to the Hotel Eco Resort or Hotel Krasnapoisky where you will rest. After breakfast you will then fly to the Kabalebo Nature Resort were you will be transferred over to Uncle Piets fishing lodge which is a smaller but very comfortable lodge. In 1986, Karel Dawson came to this part of Suriname and decided to build the Kabalebo Nature Resort in order to enjoy and share this incredible natural and unspoiled habitat. The resulting lodge has 10 twin-bedded rooms with air-conditioning, closet space and private bathroom with hot and cold running water. There is also a spacious veranda on which meals are served and which offers an opportunity to relax, watching and listening to the local wildlife. Lodge two is Uncle Piets fishing lodge which is a much smaller lodge, but very comfortable and accommodates up to 6 anglers. The resort offers an all-inclusive local meal plan as well as a bar. Breakfast and dinner will be served at the lodge and lunch will be provided aboard the fishing boats. This can be prearranged as there are many other activities including nature hiking and camping out, for the more adventurous! Day 1: Depart USA for Paramaribo (overnight flight). Day 2: Arrive early morning. Transfer to Hotel Eco Resort. Breakfast. Flight and transferred to Kabalebo resort and then a 3-4 hour boat trip to Uncle Piets fishing lodge. Day 3-7: Breakfast. Full day fishing. Dinner and overnight at lodge. Day 8: Return to Paramaribo. Afternoon at leisure for shopping and sightseeing. Overnight at Eco Resort (meals on own). Day 9: Transfer to airport. Flight to USA. A valid passport and tourist visa is required for U.S. citizens. Passengers assume all responsibility for carrying proper documentation. This area is a Malaria free environment and no shots are required to enter Suriname. Be sure to bring sunscreen and insect repellent and dramamine if you are prone to motion sickness. Pepto-bismol or immodium may help incidental traveller`s diarrhea. Note: health precautions are offered here as an informational service only. See your doctor or health clinic. The native language of Suriname is Dutch. However, the Captains and lodge staff speak English.